Did Abdullah just win the Afghan presidency? Earlier this week, leading Afghan presidential candidate Abdullah Abdullah secured the endorsement of Zalmai Rassoul, the third-place finisher in the April 5 first-round election. That brings Abdullah, a former foreign minister and the runner-up to outgoing president Hamid Karzai in the flawed 2009 presidential election, the strong frontrunner in an anticipated runoff likely to be held on June 14. Although results are due to be finalized Thursday (delayed for a day due to the high volume of serious complaints about the voting), Abdullah leads in the preliminary results with 44.94% of the vote, and if he wins the presidency, it will give the country’s Tajik ethnic minority a key role in policymaking in the years ahead. 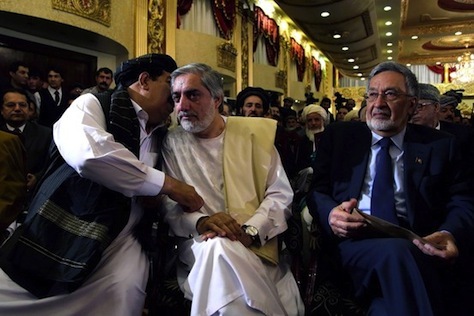 Abdullah (pictured above, center, with Rassoul, right), who is half-Pashtun and half-Tajik, served as a chief aide to the late Ahmad Shah Massoud, a top Tajik commander of the Northern Alliance, which helped sweep the Taliban out of power in 2001-02. That gives Abdullah credibility among Afghanistan’s two most important ethnic groups. His running mate, Mohammad Khan, is a former leader of Hezb-i-Islami, a Pashtun insurgent group not incredibly unlike today’s Taliban insurgency. 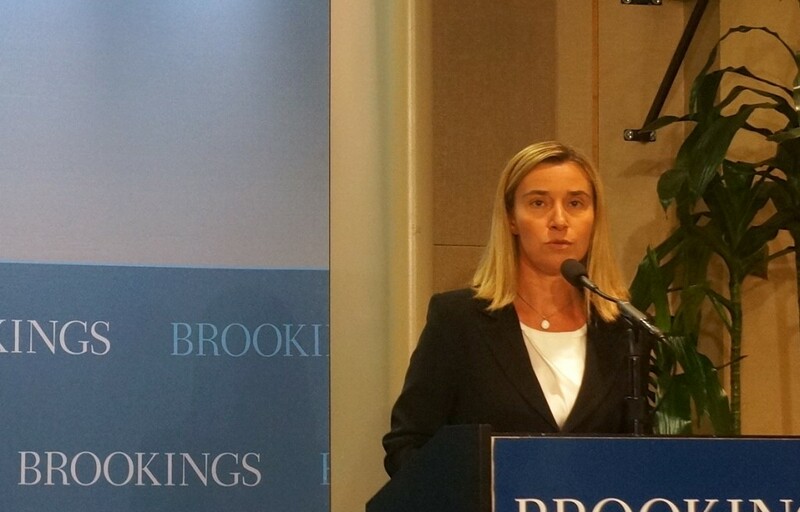 His nearest challenger is Ashraf Ghani Ahmadzai, a former World Bank official and former Afghan finance minister. Ghani was trailing with 31.47% in the latest count, enough to power him to a runoff against Abdullah — but perhaps too deep a deficit to defeat Abdullah in the second round, given that Abdullah’s first-round total suggests he’s only 5.06% away from securing an outright majority. Rassoul, who won just 11.48% of the vote served until very recently as Afghanistan’s foreign minister, and he ran with the support of Karzai’s brother, Quayum Karzai, who dropped out of the presidential race earlier this spring. Though Rassoul didn’t win Karzai’s official endorsement, he’s widely seen as the candidate of the outgoing administration, and his support drew mainly from Pashtun tribes loyal to Karzai in southern Afghanistan. In the country’s politics, building a presidential majority is less about winning over individual voters on the basis of ideology, but about cobbling together a majority from among the country’s ethnic groups. Pashtuns, largely dominating the south and east of the country, constitute around 42% of the population, and as the most populous group, have typically dominated politics — in the royal era, the Soviet era, the Taliban era and the Karzai era since 2001. Tajiks, however, are the most dominant group in Kabul and throughout Afghanistan’s northeast, constituting 27% of the population. Uzbeks, 9% of the population, predominate in the north-central part of the country and Hazaras, which constitute another 9% of the population, live in the central highlands of Afghanistan. Ghani’s running mate, Abdul Rashid Dostum, is a leading Uzbek warlord, and Ghani had hoped to build a coalition based on winning the largest share of the Pashtun vote and bringing along the Uzbek vote as well. You can see how ethnic ties play a role in the preliminary election results in this map from the indispensable website Electoral Geography. Ghani was the top candidate in much of the Pashtun and Uzbek heartlands. Rassoul was the top candidate in the southern province of Kandahar, the home of the Karzais. 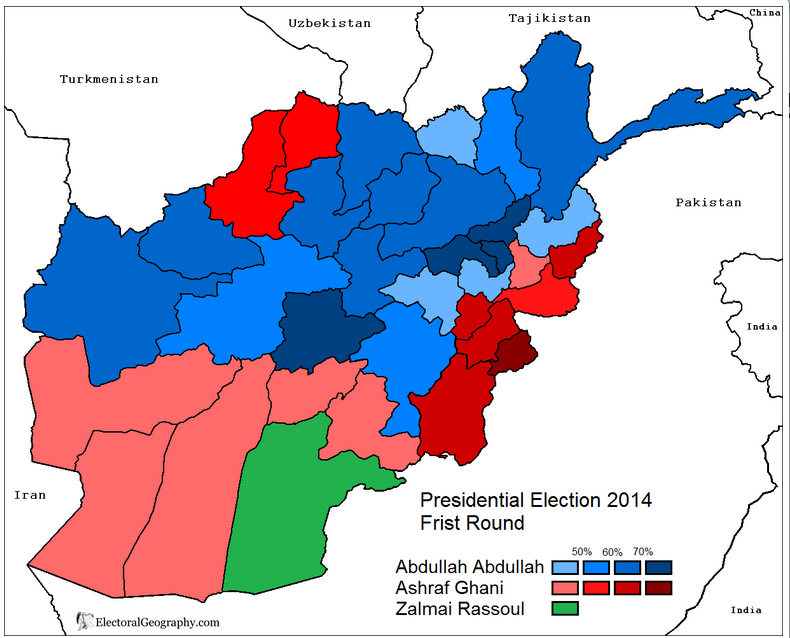 Abdullah dominated the rest of the country, including the Hazara highlands, Kabul and the Tajik northeast.